Well I just booked my third cruise this year and this will be my twenty first cruise altogether. I got a good deal with a different travel agent other that I had been using. 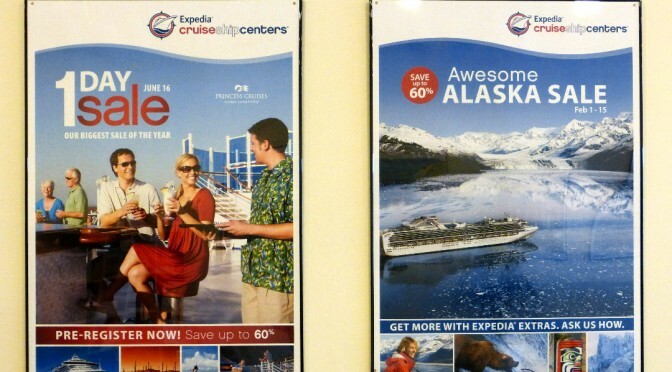 Expedia CruiseShipCenters I had heard about since they are an AARP travel provider. When an office recently opened here in Johns Creek GA (Expedia CruiseShipCenter in Johns Creek) just down the street I went to their open house. My wife Mary Ann and I met with Vince and even walked out with a $100 grand opening gift certificate. They were personable and not pushy at all. Most of all they were knowledgeable. So now a few weeks later Mary Ann found a transition cruise on the Princess Royal she wanted to take. I printed the quote from our on line research and headed down to talk with Vince about booking it. It already had a very low Captains Circle special price so I was not expecting any lower price or any extras, except maybe the $100 gift certificate but mostly wanted to give them a try. It would be nice to have a local cruise agent who I could talk with in person. 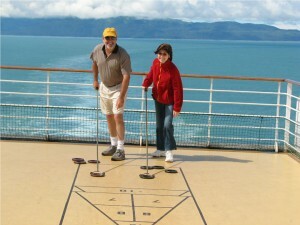 I gave Vince the on line cruise quote and our Captain Circle numbers. The deal Vince came up with was much better. Very much better than I was expecting. Besides the future cruise credits, we got another $200 on board credit for the Captains Circle (in addition to the lower Captains Circle price), plus an on board cruise of $100 for Military service plus $100 gift from Expedia CrusieShipCenters. Wow, that’s $500 on board credit for a very low priced transition cruise aboard the Royal Princess. I have never gotten a better deal than the website quoted price. So I was happy. But wait it gets better, it seems Expedia CruiseShipCenters has a sale going on April 1 through April 18th and we are getting FREE Gratuities! Wow that is worth some money. So we got a great low price on our cruise, plus $500 on board credit, plus free gratuities. Needless to say, I am very happy to have established this new relationship with our local CruiseShipCenters office and the next time we come in to talk about future cruise bookings, Vince and Dave will have everything on file for us. If you are in North Fulton County GA, stop by our Johns Creek CruiseShipCenters office located in the Kroger Shopping Center near State Bridge and Jones Bridge and ask for Vince. Their office phone is 678-712-5059.
and this testimony proves it! Hard to believe I hadn’t come across your site before — or maybe I did and I’m having a Boomer moment (they happen). 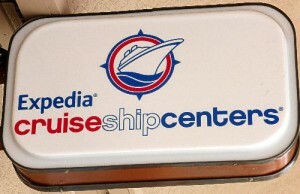 I was interested to read about your experience with Expedia CruiseShipCenters. We went on our first Azamara cruise in January. I found it looking for the itinerary and dates we needed (southeast Asia). I ended up booking through CruiseWeb. I know you were able to walk into a CruiseShipCenters office, but do you know if they do on-line booking (I’m thinking that would be a “yes” since its an Expedia product) and if they do, do you know the experience of anyone who used them on-line? Hi Suzanne. Yes on their website it says: We’re here to help – before, during and after your trip. Plus, with the availability of consultations in person, through email or over the phone, along with direct bookings through our website, you always have the freedom to book when, where and how you choose. You wouldn’t have to visit the office, but could research first on line then just give them a call. I am guessing that is how most people do it. But if you happen to live in a city with one of their office, then by all means go in for a visit, at the first time. Your writings are not just impressive but they attract me all the time. This is my third read here and I wish to share my personal experience here. I believe that using Expedia like apps/sites to find cheaper deals is really good and also better than the traditional time consuming methods. I see the website as a tool. It is simply an option to use. I am a very seasoned traveler and even I like to talk to someone when I book travel somewhere. Maybe its just my social nature, but its nice to hear someone else’s opinions and thoughts, much more than I can get from the average website. As Robert said you can do research on my website but you also have the option to call me anytime before or after a booking, and before or after your travel. Either way I’m here at your disposal. And if you do happen to book on my site without my help you will at least get a thank you and a follow up email to make sure everything was satisfactory with your trip! So weather you use it as a booking tool or as a research tool, I’m here for YOU, and my services cost you nothing! And nobody knows everything, especially me, so when you call me with any questions if I don’t know the answer, I have many other resources here in the office that I can ask to find the right answer to whatever question you ask! Part of the reason I got into this business was because I enjoy dealing with people! So if I can ever help you or any other of your fellow Boomers, don’t ever hesitate to call me directly! As I said I’m always at your disposal!! Expedia is one of the famous travel site . 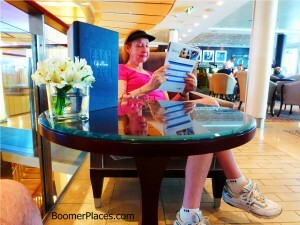 Moving around or going for vacation would be great idea for boomers other than just sitting in the house. Many of them plan and start working on it but some times due one or the other issue it gets cancelled or postponed. I think to start planning for such type we first have to meet a travel agent or a website. Expedia is one of the best out of them. Though I have never tried it but have heard a lot about it. I think your experience with them has been wonderful and after reading this post I will actually try this site . Great service and customer satisfaction is the key to successful business and I hope Expedia has it . A travel agent is always your buddy all throughout the trip. If something goes wrong, you are certain that there is someone to help you straighten things out. So as a traveler, don’t think of going solo just because of the thought of spending a little more than expected. The convenience the travel agents provide in your travel makes every penny worth it. Interesting story, Robert. I think a lot of us — even Baby Boomers — have become so used to booking online that we don’t think about using the expertise of a travel agent any more. But as you’ve shown, it can pay dividends. I had a similar experience last year with a complicated trip involving multiple air flights and layovers. After searching online, I went to my local travel agent, who found flights I never would have found, helped determine the best schedule, and delivered the whole package for the same price as a simple return flight. I was so impressed I wrote a blog post about it. Looking at multiple offers is always a good idea when booking a trip, but using a travel agent should still be one of your options. And by the way: 21 cruises — that’s impressive!